Chief Minister Prem Kumar Dhumal has appealed to the people to liberally contribute towards the welfare of armed forces and their dependents by sending donations to the Armed Forces Flag Day Fund. The appeal was made by the Chief Minister on Armed Forces Flag Day after he was pinned a Armed Forces Flag to observe the Armed Forces Flag Day, at his official residence here today. Chief Minister said that every year December 7 was being observed as Armed Forces Flag Day to remind people of their responsibility towards the martyrs, ex-servicemen, their wards, war widows and injured soldiers who had contributed significantly to the cause of the nation. He said that the day was being marked as solidarity day towards the armed forces of the country. He said that it was the duty of every individual to contribute liberally towards the Fund so that the funds thus collected were spent over the welfare of the dependants of martyrs, ex-servicemen, war widows and others who had been injured while rendering valuable service towards the humanity and the nation. He said that Himachal Pradesh was proud of its serving and ex-servicemen who had made the people of the State proud by serving in the armed forces and making supreme sacrifices. 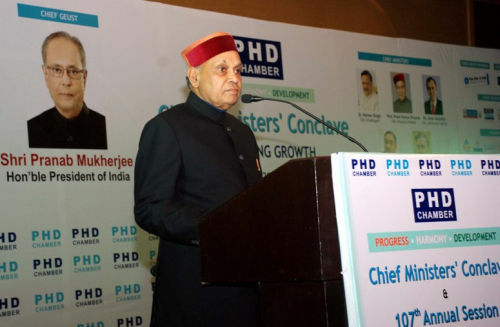 Prof. Dhumal said that the State had created a separate department to look after the welfare of the ex-servicemen and their dependants besides a welfare corporation to cater to their needs for rehabilitation. He said that the State had a glorious history of having won the First Param Vir Chakra after attaining independence by Major Som Nath Sharma who hailed from district Kangra and out of the four Param Vir Chakras awarded during Operation Vijay to flush out the infiltrators from Kargil heights in Laddakh region, two had been awarded to the soldiers belonging to Himachal Pradesh. He said that there was a long list of winners of different gallantry awards by the soldiers from the State. He said that the State Government had been sympathetic towards the welfare and rehabilitation requirements of the ex-servicemen and their families and a number of schemes launched for their welfare. Chief Minister said that it was moral responsibility of every individual to extend their cooperative hand towards the welfare of the ex-servicemen and help them in leading a reasonably secure life. He said that donations made under the Armed Forces Flag Day Fund were exempted from income tax under concessional provisions.